Your Earth has for some time now has been waking with you, evolving in Her own journey too, allowing Her own consciousness to come forward in order to become in Harmony with Her inhabitants – you! During this reawakening process, many Light Codes have been downloaded through your inner energetic portals – your chakras for examples in order to help you reconnect that which has always lain deeper within your ancestral memories. This next wave of energetic sweeping, you will once again be faced with clearing out what is no longer necessary to carry, but will now bring you into a different foundation than you have ever experienced before. You are coming into a time of Adjustment, where the triggers of the Light Codes, such as the 11:11, 12:12 on your time clocks or dates, the resurgence of emotional pieces deep within, the pulling of your heart calling you to move and act on in certain directions, and memories of your deeper purposes of why you are here, are all part of the Integration that you have now undergone these last several months. You are now in that time period that dictates rebuilding the "House" that you have chosen to live in for so long. Remember, all of you came to the Earth with the full knowledge of the Grand Design, not just the Design of the Universe, but the Design of Who You Are as an individual, as a race, and Who You Want to Be as you spiral through continuous re-creation. In addition, you carry the codes for full awareness of how to build this Earth that you reside on. As has been mentioned in past transmissions, this knowledge that has been encoded in your ancient DNA and cellular constructs, includes all the blueprints, all the original sets of the Design, ready and waiting for you to become aware of it and put into action when the time was correct. This is that time. 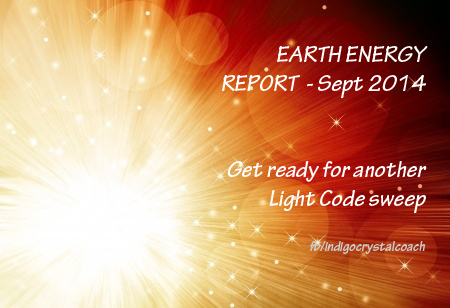 Now that energetic adjustments have taken place (which we will add has been occurring specifically since 12-12-12, you are now ready to take your place and access the information stored in these Light Codes. This is the information as to how you wish to this Earth Be like, and how You wish to Be Like in conjunction - and you have gained access to it now. Remember, this Earth is by and large Your Creation! Know that in order to become aware and understand that these blueprints exist (yes this is your treasure! ), it is equally important to know that there is the pre-design as well. In order to know the blueprint, you must have already had a pre-conceptualized idea of the end result, in order to create it in the first place. Just like constructing the house, the blueprint is the instructional and intentional structural design with the end result already pre-envisioned. And that someone who had a hand in creating it all – was each and every one of you. It was you that decided to take Higher Dimensional Knowledge from places far away from your Earth – your Star Systems of which you are and always have been a part of. It was you that chose to use this Knowledge as a model to seed a New Earth – the one you have on. Dear Ones, you took that original vision and formed into a structure, with instructions of course, and purposely embedded it into your cellular memories so that one day – of which you are now in – you would wake to remember what you stored there so long ago. You see, this is how you are both a Creator and Builder of your own Design. What is happening now on Earth and within you individually is like a house renovation. Much of your "foundations" that have been built over multi-millenia has not been functioning to its highest potential and capacity to date. And through all of you – your willingness to stand up and decide that what you have become as an Earthly race is no longer acceptable, is what is at play here. What was motivating that awareness through each and every one of you is the deep knowing that there is another, better, and ‘higher’ Design that was meant all along. This next wave in your month coming up, is about you Arising within yourselves and moving deeper into the knowledge of these blueprints, these pieces or nuggets of awareness of what needs to not only change, but now what needs to be put into its place. This includes the role you are now re-evaluating on a personal level as to how you wish to be, how you wish to conduct yourself as a human being, how you choose to respond in your interactions with others, and above all, how your deeper individual purpose needs to be expressed just like the thread of spider’s web. For your individual expression is that thread that is inherently connected to the matrix of the whole. There are many who are keenly watching you as to how you choose to evolve and rebuild your Earth, for its purpose was equally to serve as a model for other planetary systems as well. There are many in your star systems who are far more advanced in their evolutionary awareness, and many who are still awakening as well. The matrix is far beyond anything you could truly envision at this point, Dear Ones, but know that everything that you do, really does have a ripple effect not just on your planet, but through the vast stretches of Universes. Just as much as you are a point on the matrix, the Earth Herself is equally a point on it too. How you rebuild your House is crucial now – as what you now choose to Release into the ethers, will boomerang back with a greater force than it ever has been to date. In these next 30 days of your time, your Light Codes will be released in greater intensity, from the Earth (through the rumblings, shakings, fire columns [editor note: meaning earthquakes and volcanic eruptions]), from your Sun (through solar flares), your Moon (through vivid dreams, intense emotions, visions, ear ringing, etc), and Star Systems too. Some of you may still experience these changes through the physical body as well – as always these feelings are temporary and will pass in due course. There will be many who will be choosing to leave your planet at this time, as their purpose here is no longer serving its purpose, and they are choosing to become part of the rebuild in another, higher form. Bless them, for they too are awakening to that deeper awareness of their purpose as well, and simply choosing to readjust how they wish to express that purpose. In addition, one of the hidden treasures that you have carried from the beginning is Intuition, your ‘wireless’ connection to All That Is surrounding you. For that is part of your blueprint as well Dear Ones. We see that many of you are finally allowing this to work for you, rather than sitting passively by and observing others using it. For the Grand Design was never one of exclusion but of inclusion. We say, the time is now, to fully embrace this as part of your treasure trove, and use it to its fullest capacity that was meant for. By utilizing your intuitive guidance within, you are stepping into your power as an Emotional and sensory being, and thus flinging the inner doors as to your own individual and deeper purposes. So use it as it’s meant to Dear Ones!